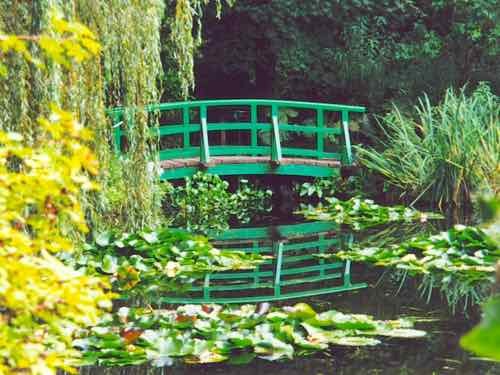 If you love Impressionist paintings, why not plan a visit to Giverny and see Claude Monet's garden, flowers, pond and bridges for yourself? 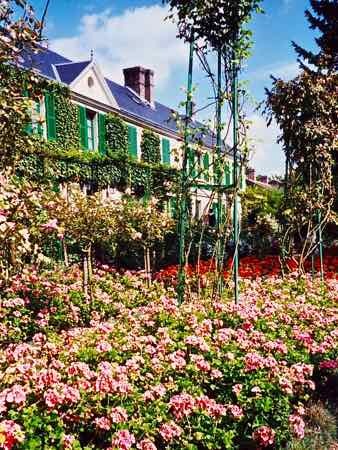 Giverny was Monet's home during the last half of his life. It's been said the Impressionist art movement acquired its name from one of Monet's paintings called "Impression, Sunrise". But it was the bridge and the flowers in his garden at home that he painted most often later in life. See... You don't have to be an art connoisseur to enjoy a visit. The gardens are a joy for anybody to see. If you're not into art, but you like Monet's water lilies, it's fun to see where they grew. Walk that arched green bridge that he painted. See that little green boat on the pond. It's still painted the way it was when he lived there. The rooms still have the collection of Japanese prints that he collected. The kitchen with its blue wall tiles is memorable. Here he entertained other artists.... like Renoir, Matisse and Cezanne. He really spent a lot of time developing that Norman garden that surrounds the house, personally supervising everything. Different at different times of the year. Later he diverted a river to form a pond. He planted the willows and bamboo along its shore. Once they grew up, he painted them often. He filled the pond with lilies. Then came the green bridge which eventually became draped with wisteria. Both the Norman Garden and the Water Garden are filled with rare plants from all over the world. He painted all of this at different times of the day and times of the year... playing with color schemes and.... impressions. Think of those large fuzzy water lilies in the Musee de l'Orangerie in Paris. The village draws thousands of tourists every year. Explore the village with its little country church and half-timbered houses. Guidebooks will tell you to see the Museum of American Art which is nearby. It displayed American artists like Mary Cassatt, Winslow Homer and James McNeill Whistler. That Musee d'Art Americain has now morphed into the Musee des Impressionnismes. Open in May 2009, the first special exhibit will be "The Garden of Monet at Giverny: The Invention of the Landscape." The little village is about 50 miles (80 km) from Paris. Or it makes a good stop on a driving tour of France if you are heading toward Normandy or anywhere in the north of France. The best time of year to go is Spring through Fall when the flowers are in bloom. 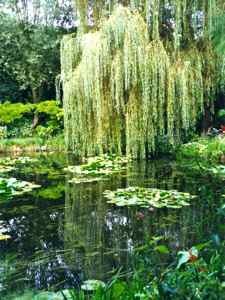 So stop in Giverny at least for a few hours and wander among Monet's gardens. Feel like you've entered one of his paintings. By a print or two for yourself.... the shop sells almost anything you can imagine with an image of a Monet painting on it. Wear a "water lily" scarf and you'll be transported in memories back to that garden every time you wear it.